It's been a long time since I've written a Full thrust AAR so when one of our players that had moved away some time ago was back in town looking for a game, I thought this would be a great opportunity to write one. This AAR centers around two very different fleets. 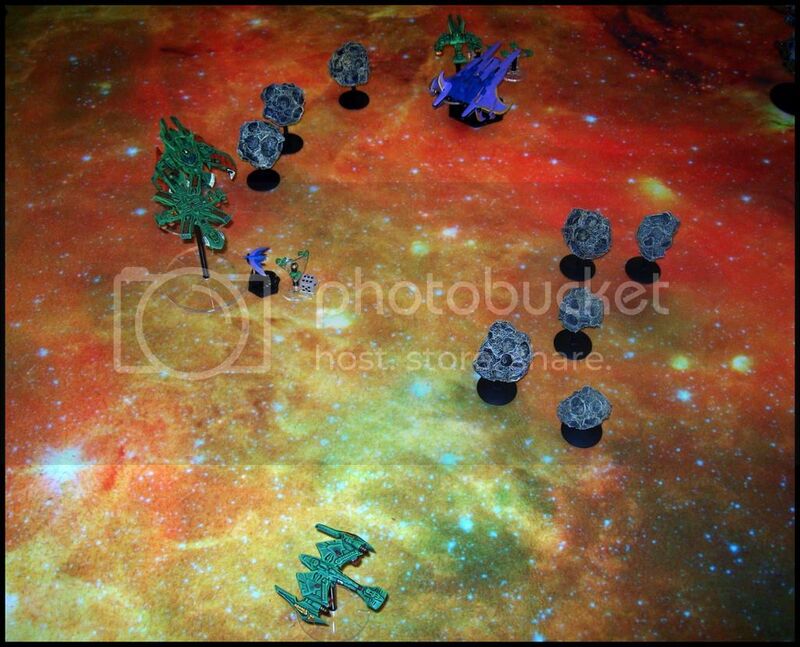 The game would be 3,000 points and set in a dense asteroid field orbiting a small earth like planet. 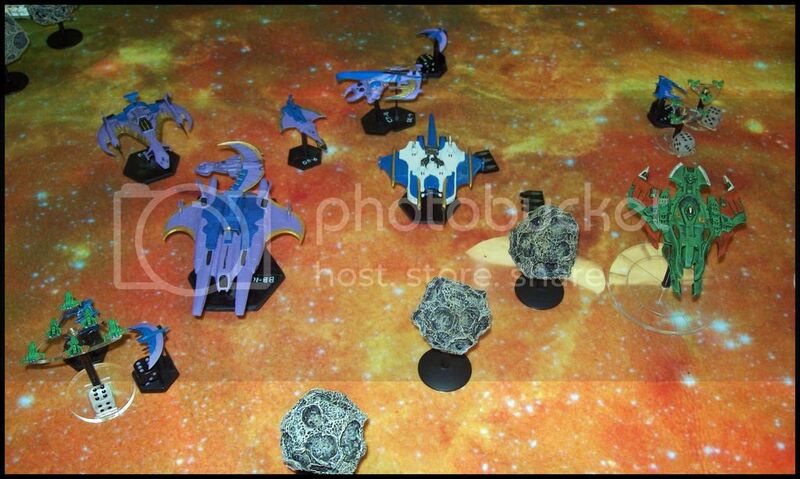 First up, The Kharadorn Empire from Ravenstar Studios. This fleet was built around a battleship and heavy carrier backed up by an assortment of cruisers. Screening the fleet would be two squadrons of FTL capable gunboats. 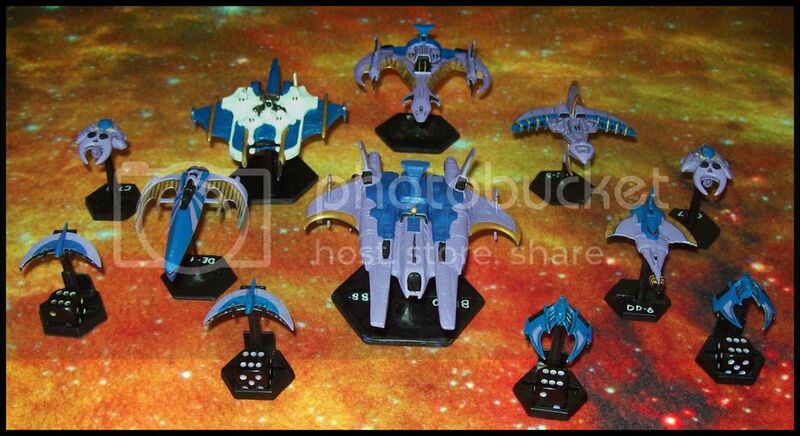 Next is the Centuri fleet from the tv show Babylon 5, models by AOG. This fleet was built around two very large ships as well with several cruisers and two corvettes. The fleet is well equipped with stealth systems making targeting these ships at long range difficult. 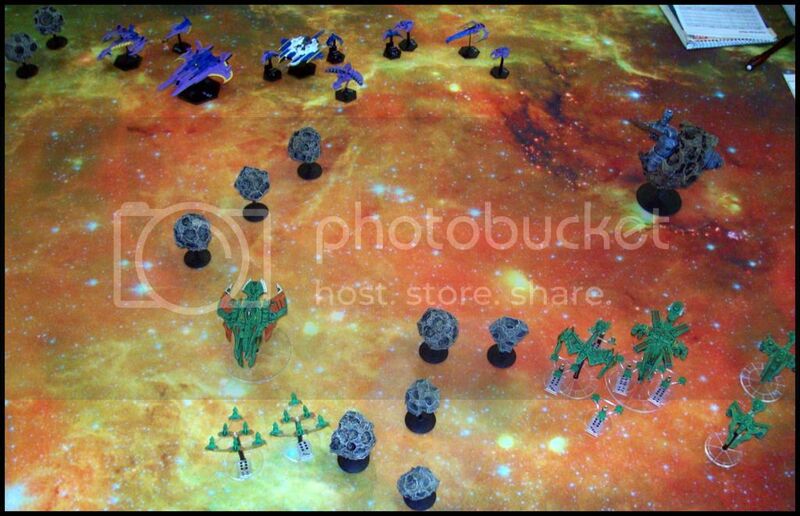 The Centuri set up with their largest ships taking point with the whole fleet in relative close formation. The Kharadorns set up in two distinct groups, mostly necessitated by the tight terrain. One group was the battleship and gunboats with the other group centered on the carrier and the cruisers. The Kharadorn plan was to attack the Centuri from two different directions and from the flank. A head on confrontation would almost certainly end up favoring the centuri. 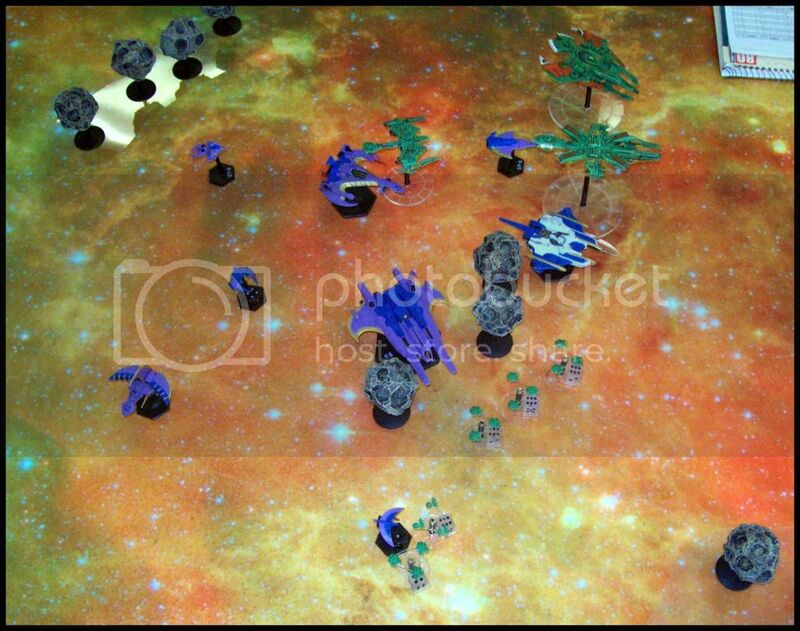 The Centuri fighters outnumbered the Kharadorn fighters so it was hoped the missiles on Kharadorn ships would keep their fighters busy and burn fuel while Kharadorn assault shuttles waited to strike. 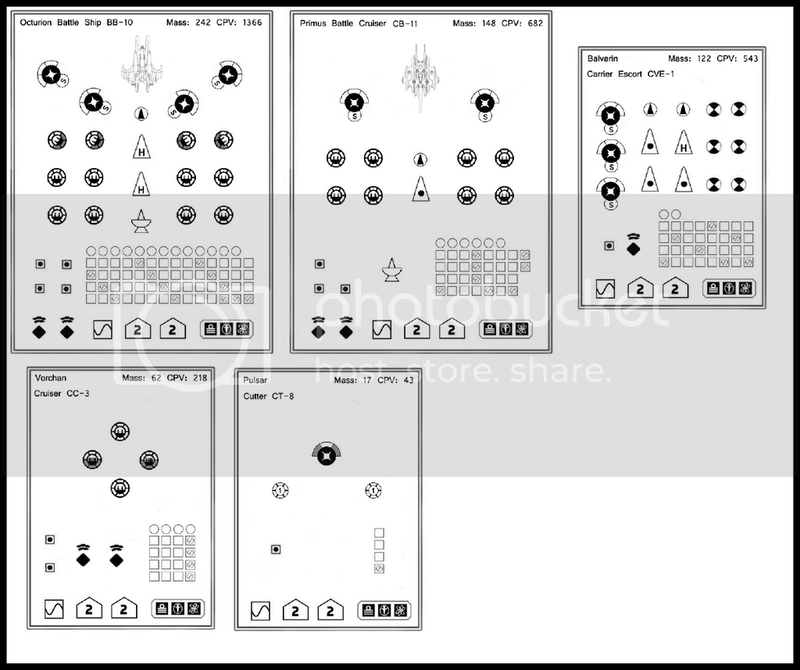 The first turn started with all ships moving at double their thrust. All ships that could launch fighters (or assault shuttles) did so in short order. None of the Kharadorn ships could get a solid firing solution on the Centuri ships so no missiles were fired. Very little fire was exchanged and most of that favored the centuri. Because of their stealth fields the Kharadorn would have to close to within 16mu before they could even lock their weapons. However, the small Centuri ships had no stealth fields so were targeted mercilessly. One was destroyed outright and the other took heavy damage. The next turn things started to get really interesting. 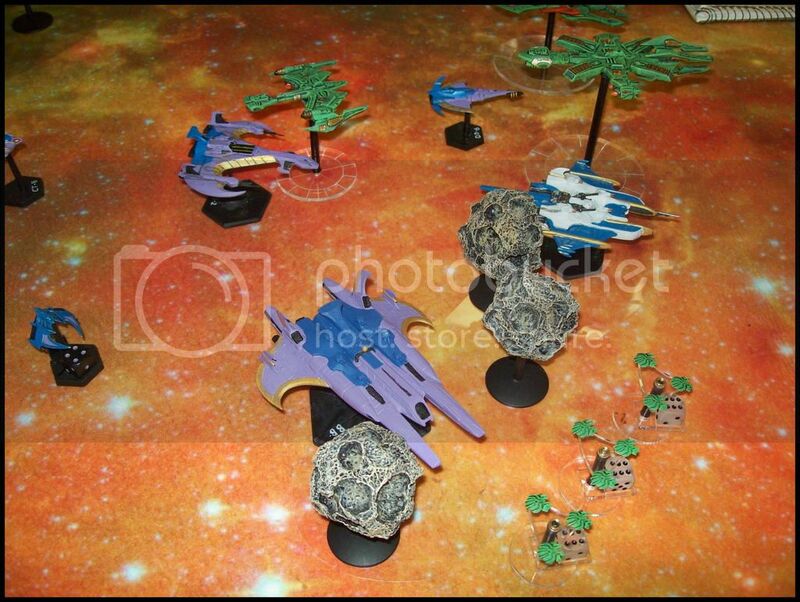 The Kharadorns were able to launch missiles from only the carrier and heavy cruiser. The battleship was not able to launch due to the asteroid field. 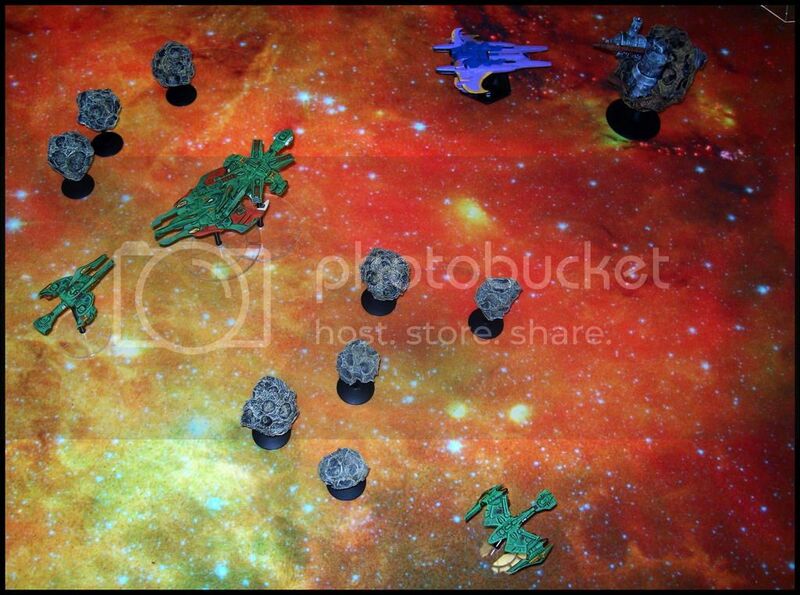 Several of the ships also plotted emergency thrust to clear the asteroid fields and bring their guns around faster. All ships made the required die rolls except for the heavy cruiser which almost blew off her own engines. It would be a couple turn before the crew managed to fix the engines and bring the ship into the fight. 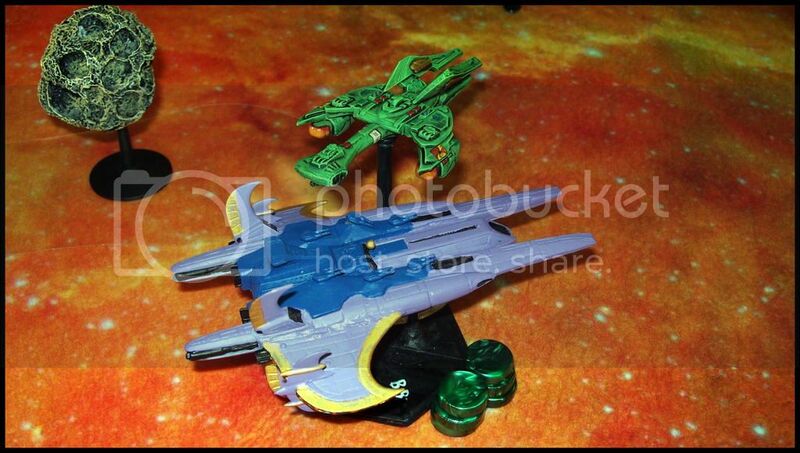 The missile salvos locked on the Centuri Pimus Battlecruiser. Two Karadorn fighter squadrons tangled with one heavy fighter wing and one of the gunboat squadrons took on two other fighters. Four missiles got thru to strike the battlecruiser causing considerable damage. 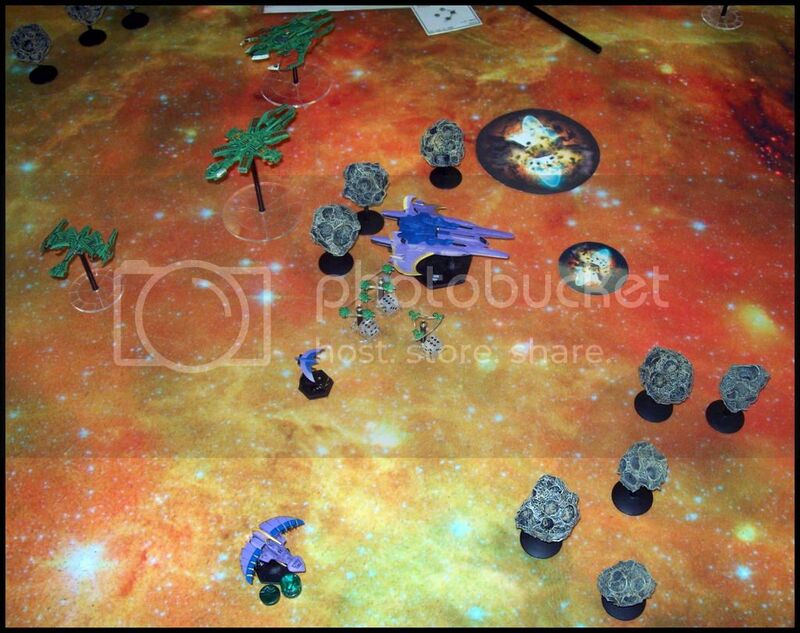 The Kharadorn gunboat squadron was badly mauled by their attackers but downed several enemy fighters as well. 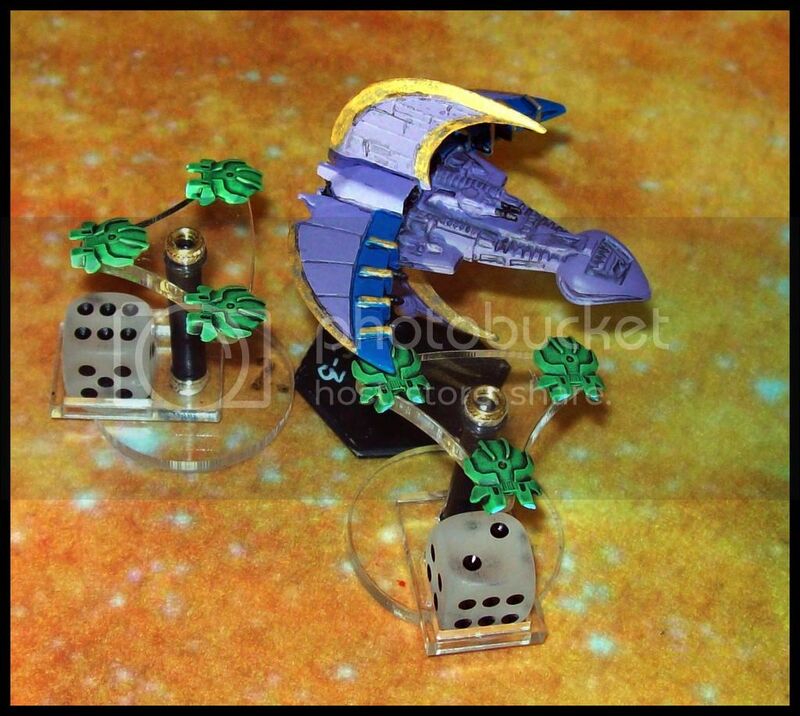 The Kharadorn were also just within range to fire their weapons. All of the ships concentrated on one of the trailing cruisers destroying it completely. The centuri were mostly blocked by the asteroid field and also in a bad position not being able to bring all their weapons to bear. The return fire managed to damage the light cruiser and carrier but it wasn't enough to force a threshold. The Centuri battlecruiser was not so fortunate. 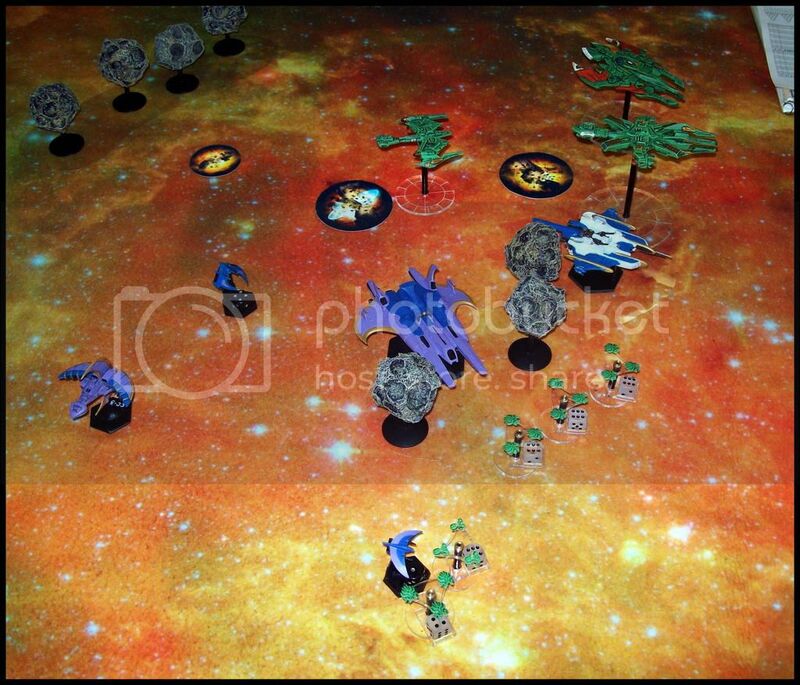 The next turn the Centuri fleet began to scatter. 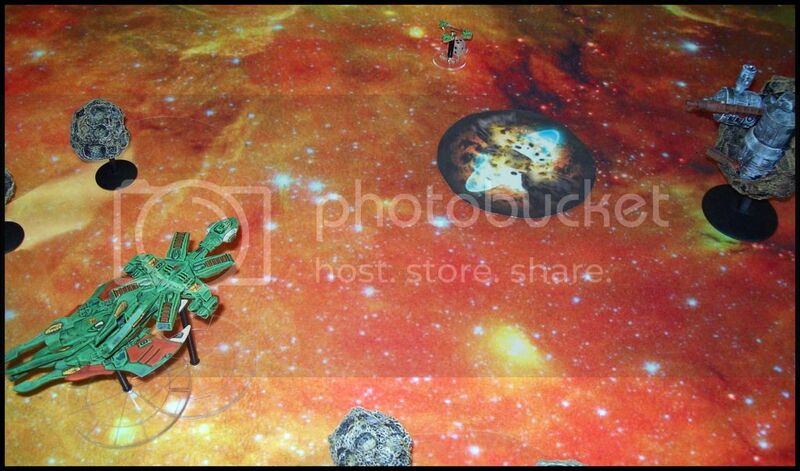 The damaged battlecruiser ducked into the asteroid field looking for cover. 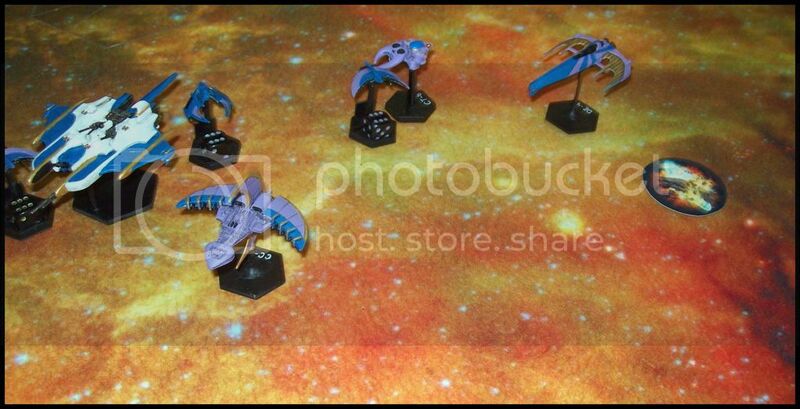 The Octurian battleship followed suit hoping to get in behind some of the Kharadorn ships or at least throwing their formation into chaos. The Kharadorn assault shuttles hid near the field still waiting for a chance to pounce on a vulnerable ship. Unfortunately one wing of shuttles is jumped by a Centuri fighter squadron despite a screening group of interceptors. The Kharadorn fleet started to turn hard to keep close to the century ships. If the distance were to open their ability to target their opponents might become confounded by the Centuri stealth systems. Suprisingly the light cruiser and enemy carrier ended up at point blank range and the Kharadorn carrier was at very close range to another Centuri cruiser. The results were predictable with three century ships destroyed. The running corvette was easily dispatched by the Kharadorn battleship. The carrier destroyed the Centuri cruiser and the carrier was destroyed by the light cruiser and supporting fire from the battleship. The light cruiser took some damage forcing a threshold check that gutted its hangar bay. The carrier took some minor damage as well. What saved the Kharadorn fleet in this exchange was the Centuri battleships choice to turn into the asteroid field which blocked all its lines of fire. The next turn things started getting intense. The Vorchan class cruiser which had, thus far avaioded combat, began swinging around in an attempt to join the battleship coming thru the asteroid field. Unfortunately she was jumped by two wings of assault shuttles. Despite all the Vorchan fire, four boarding parties managed to get aboard. The other Kharadorn cruiser misjudged exactly where the battleship would come out of the field and eneded up much closer than she would have liked and all alone. The Kharadorn heavy cruiser had previously managed to repair its engines and swing around back to the fight. While still out of range to fire its weapons it could launch a missile salvo which caught the battlecruiser as it emerged from the field. With very little way to defend itself the ship was destroyed. 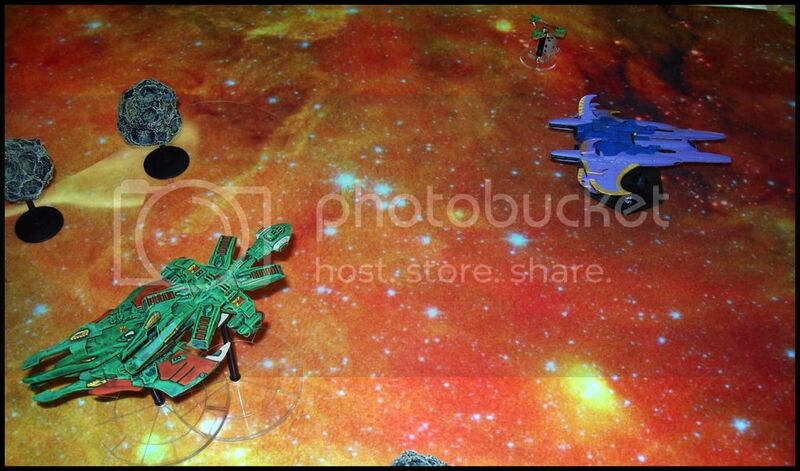 The Centuri battleship and Kharadorn cruiser exchanged fire. The cruiser was completely destroyed but the battleship lost a considerable amount of armor and sustained some hull damage. The Kharadorn light cruiser also scored a fair amunt of damage on the Vorchan at long range. Rolling several 6s in a row is a wonderful thing! The next turn the Kharadorn heavy cruiser accelerates into the fight and comes nearly nose to nose with the battleship. It seemed a safe bet this ship would follow the fate of its predecessor the turn before. Both the Kharadorn carrier and battleship accelerate and turned hard to get around the asteroid field and bring their guns to bear aft of the century battleship. Two assault shuttle wings made what seemed to be suicidal runs on the battleship. It was hoped they would draw off some of the ships twin beams in self-defense thus sparing the heavy cruiser some fire. The tactic worked to some degree with the ship using four of its beams on the shuttles. Six marines managed to get onboard however. Amazingly the heavy cruiser is not destroyed and only loses one row of hull boxes with the resulting threshold check doing no significant damage. The battleship also loses one row of hull boxes and its threshold checks result in very little loss. However, on the next turn it found itself in a very precarious position. Both the Kharadorn battleship and carrier were coming up fast from behind. Both sides fired mercilessly at each other. In two turns the Kharadorn carrier was badly damaged and the Centuri battleship was completely destroyed. The boarding action on the Vorchan cruiser resulted in its capture as well. All in all Im pretty happy with how this battle went tho I expected the Kharadorns to take many more casualties. The game defiantely became one of maneuver. The gunboats could have been used to much greater effect. They were essentially thrown away. The assault shuttles, while annoying for the Centuri and fun for me, were by no means game changers. In fact most of the Kharadorn boarding parties on the battleship were killed by friendly fire. The captured Vorchan was pretty much a wreck with its bridge destroyed, before the ship was ultimately captured. The biggest impact was from the Kharadorn plasma cannons. Against unshielded ships they can be devastating if you roll well enough and I was rolling uncharacteristically very well! Sweet, thanks for the report. Like to see Full Thrust action going on. Did you feel the points were a fair reflection? I was watching this game and I promise you Jim was giggling like a school girl every time he rolled a bunch of 6s. Nice! We were just talking about FT at the club on the weekend, and seeing as I've got a Centauri fleet your post is both inspiring and timely! Did you make the ship stats for the Centauri, or is it available somewhere? I wouldn't mind a copy, if you don't mind. Tony S, there are pictures of the Centauri SSDs on the "link" under the first Centauri picture. Actually, there's most of the Kharadorn list, but just the Primus for the Fanheads. I THOUGHT there was a list on Emerald Skunkworks, but if there, I'm not finding same. 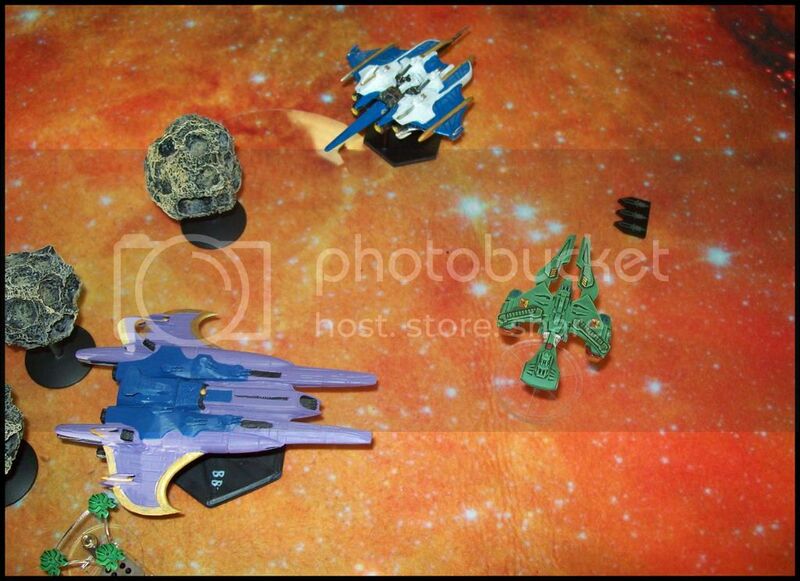 Star Ranger has three ships designed, but different philosophy from above. I posted the Centuri SSDs in this but for whatever reason TMP ddint show the pic, just the link to them. Why was the Kara dorm Battleship and heavy carrier right on top of each other moving across the board? Nice AAR! Those minis are pretty cool! 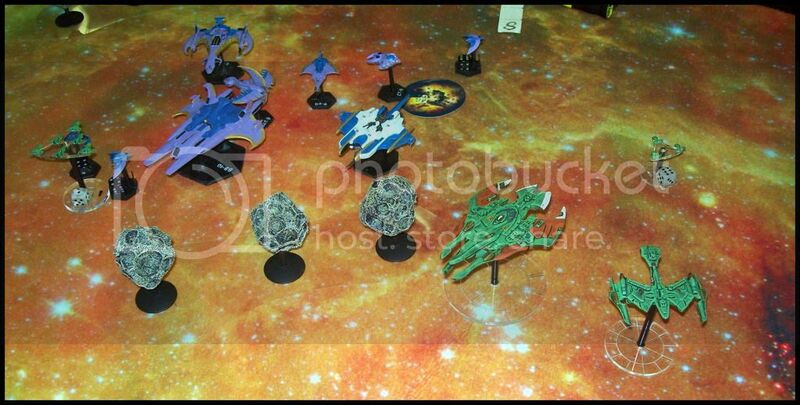 Story wise lets just say the captains of each ship were racing each other to get the last kill…heh. Actually that is a ferocious tactic the Karadorn bring to the fight which can over when a opponent but can also put them in a hairy situation . Ah, Jim, just found the 'link'. Edit: Did I mention how DAMN PRETTY it is? Glad you found the link :) I have no idea why TMP put the link and not the pic itself. 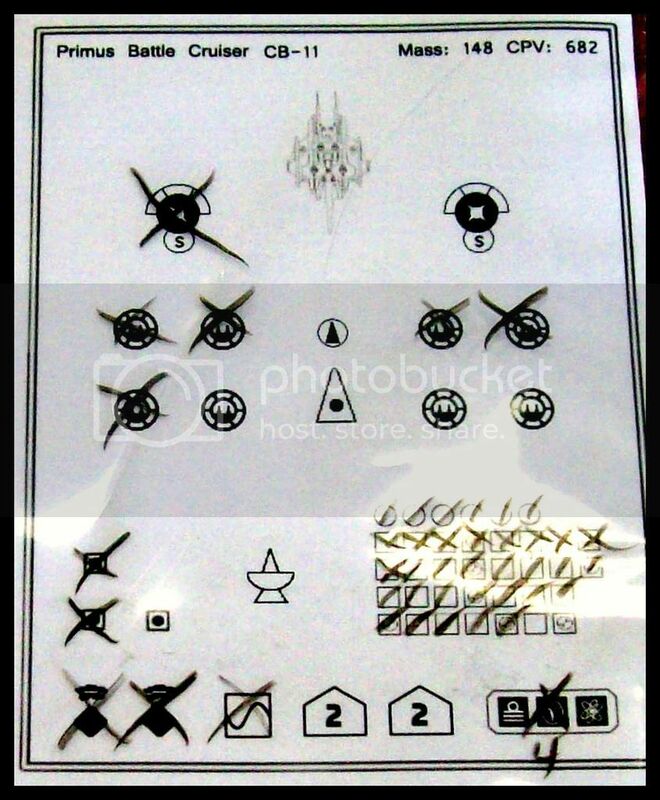 Do Ravenstar's Kharadorn miniatures come in one piece or multiple pieces? 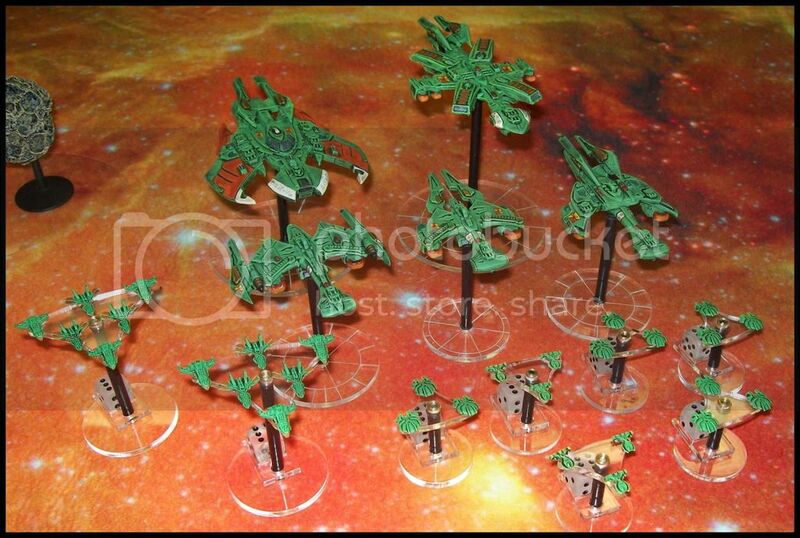 The Xtreme Hobby Kharadorn miniatures came in multiple pieces, which I don't care for. Multiple parts.the Karadorn are easy to build but you can't have those designs with out parts. Theyre very easy to clean and assmble. The hulls are all in one piece you just need to put the engines on. Very much worth buying!